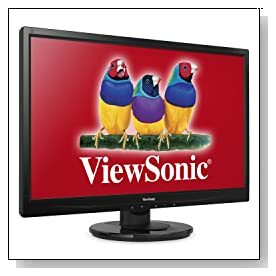 ViewSonic VA2746M is a 27 inch Full HD LED screen monitor with 20M:1 mega dynamic contrast, 300cd/m2 brightness, built-in stereo speakers, widescreen cinematic aspect ratio with auto adjustment function and ideal for the best image reproduction. 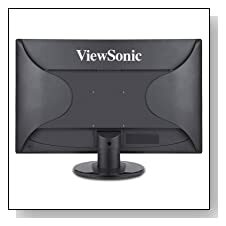 ViewSonic VA2746M is a large bright, easy to read on type of monitor with its 1920 x 1080 pixel resolution and a screen with a glossy thin bezel design at a very reasonable price. It is VESA mountable on wall or monitor stands (10 x 100mm), with this feature you need to unscrew four screws only and mount the ViewSonic on a wall mount or another monitor stand. The tilt moves up and down on base and the monitor will sit safely on your desk with secure connections. It is Energy Star qualified being a LED display- using less than half energy of what similar monitors use (Around 20 watts in normal brightness settings). Although the savings on energy bills may appear small on a single monitor, they will be huge in a corporate or school environment with hundreds of screens set up. It has an Eco mode and is an environmentally friendly device with the mercury-free backlighting and low EMI- Electro Magnetic Interference. It comes with minimal cons such as.. There is no HDMI port on it (but DVI with HDCP and VGA ports) and the touch buttons may feel a little hard to operate at first but then you get used to it. It comes with 2 watt speakers so they are not overly loud but they are quite clear and many other monitors in the market come with less or none. Then the quality of the screen is so good that you won't even notice these small negatives. You get clear and sharp outstanding images with great detail with the 3.4ms response time, smooth video and multimeda experience. ViewSonic VA2746M comes with multi-window viewing simultaneously without having to switch windows and the 16:9 ratio reduces eye fatigue dramatically. You'll get rich and lively images with the brightest colors with the 20M:1 MEGA dynamic contrast ratio, which identifies the picture brightness and instantly arranges the backlighting so that you get to see the best of contrast and range of colors. It is offered with a 36 months limited manufacturer's warranty. In the package, you will get the ViewSonic VA2746M LED display monitor, VGA cable, audio cable, power cable, ViewSonic Wizard CD, Base Instruction and Quick Start Guides. It is a great value monitor that will be ideal for school, work or home use. Although perhaps it doesn't look as nice as some of the top of the range- expensive monitors it offers great value for money with its high performance to cost ratio, no dead pixels, VESA compliance and 3 long years of warranty.